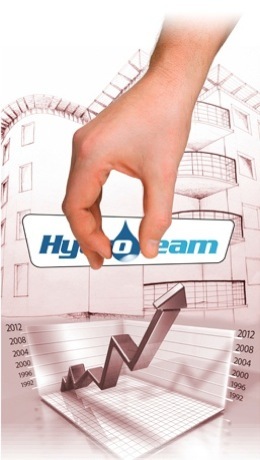 The company « HYDROTEAM » D.TRAPEZARIS – D. ZERDEVAS O.E. is established in Athens and started its activities in heating and cooling installations in 1992. It is the distributor for the companies: TOUR & ANDERSSON AB, Kamstrup SVM AB, PERRY Electric Srl., WATTS Industries Europe, PNEUMATEX AG, F.D.I and JRG . The purpose of these co-operations is to provide the Greek market with new products of high technology and quality for the modern designed HVAC systems. Our effort is to achieve the perfect indoor climate conditions with energy savings and high efficiency. TA is the world-leading brand in hydronic solutions. It is the brand that experts turn to when the solution needs to be absolutely perfect. In order to live up to these expectations, we set great value on our knowledge, and how we use it and spread it. TA, with more than 500 employees in offices worldwide, is the global market leader in hydronic balancing for waterborne heating and cooling systems. We are in a period of strong growth and aim to be the most customer-focused, knowledgeable and innovative hydronics company in the world. Kamstrup SVM is Sweden's leading and most experienced company in the field of heat measurement. It was founded in 1942 and has since then provided measurement equipment and collection systems for all types of installations from district heating plants and energy companies to private homes. Our production and service entities are both located and have always been located in Sweden. We contribute to the conservation of the country's natural wealth as well as to reducing energy consumption. Kamstrup SVM develops, manufactures and markets products and services for multi-mode measurement, i.e. measurement of electricity, district heating, district cooling, water and gas. These products enable our customers to improve their profitability through, among other things, more effective energy consumption. This, in turn, results in reduced energy costs and less environmental impact. Perry Electric is an Italian Company that develops and manufactures devices for time and energy control, comfort and temperature control, gas safety and home automation with the innovative PDA©(Perry Domotic Assistance) system: PDA©Videophone for the wireless transmission of images, commands and data and PDA©Energy for the wireless control of the temperature in zone systems with consequent energy saving and protection of the environment. Perry Electric invests every year relevant resources in R&D in order to keep its product range constantly updated and answer to the ever growing requirements of the market. A group of people fully committed to achieve the Company's goals. Perry makes use of state of the art equipments for manufacturing and testing. All Perry products comply with the European and International standards and are 100% inspected. The concept of quality is constantly present in the Company's life. Watts Industries Europe develops and manufactures an extensive range of valves, units, controls and accessories, with sales generated through specialized wholesale distributors and OEM's. With 26 companies, 20 sales offices and 20 production sites, a workforce of more than 2000 people, Watts Industries Europe realises an annual turnover of more than EUR 400 Million. The water management of heating and domestic hot water systems is our speciality. By optimising pressure maintenance, degassing, and water quality we ensure a long lifetime and a high reliability of the systems. We develop, manufacture and distribute a wide range of products which are supported by our professional consulting and customer service. Our own production for central heating controllers and boiler control units.